Location: Amalfi Coast Resort, Scenic Gulf Drive, Miramar Beach, Florida (one mile west of Silver Sands Outlet Mall on Scenic Gulf Drive). Want to stay in a place that arks around a tropical lagoon on one of the highest elevations on the Emerald Coast? If so, then you have got to try our condo at the Amalfi Coast or at least our Florida version of the Italian original. Barefoot by the Sea sits on eight and one half acres of beautifully landscaped grounds on Scenic Gulf Drive. The elevation here was created by an old dune which was used by mariners to mark this part of the beach from the adjacent flats. The gated beach access across the street from the Amalfi Coast takes full advantage of this height with an old fashioned Observation Gazebo which sits above the staircase that leads down to the beach. The condo complex wraps around twin swimming pools which are elevated above a natural lagoon with a festive fountain. A graceful, arching pedestrian bridge from the pool area crosses over the lagoon and past the palm trees to take you to the beach. The simultaneous views of the twin pools, lush landscaping, lagoon and grassy lawns with the gulf in the distance are quite stunning. Barefoot by the Sea is one bedroom with two baths, fully equipped kitchen, open dining and living areas, a hallway cove that includes bunk beds, washer and dryer as well as the covered balcony. $300 reservation deposit required to hold the unit at time of reservation by check or credit card. Balance of rent due 30 days prior to arrival. Cancellations of less than 30 days subject to loss of deposit. Rental not available to vacationing students or singles under age of 25. No smoking and no pets. Our condo shares one thing in common which is a fantastic location on Miramar Beach. 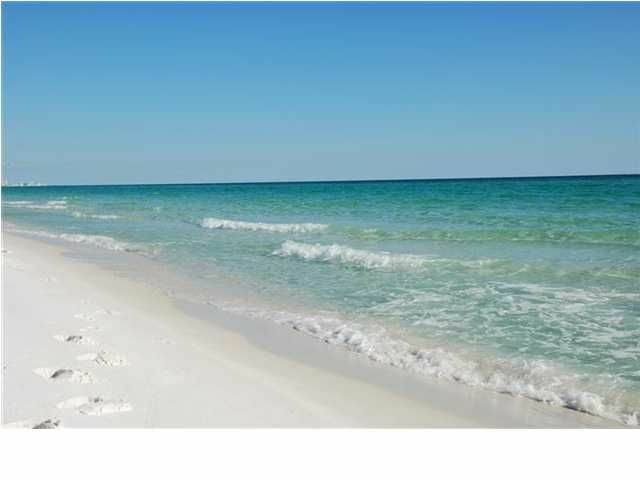 Located half way between Destin and Scenic 30A in South Walton you have the best of both worlds so to speak, due to its conveniently centralized location. Scenic Gulf Drive has beachfront dining just minutes away at The Whale's Tail, Pompano Joe's, Royal Palm Grill and The Crab Trap. The largest Designer Outlet Silver Sands, is also located in Miramar Beach. A multitude of restaurants, shops, galleries and live entertainment abound nearby at Sandestin, Baytowne Wharf and on Grand Boulevard. Brand new state of the art Sacret Heart Hospital within two miles with 24 hour emergency and helicopter. We are a military family and I retired in the area after serving 22 years in the United States Air Force. I knew the Emerald Coast and this little slice of paradise was my 'home' after my tour to Eglin AFB almost 25 years ago. I met my husband here and we love the powder sugar beaches of the area, swimming, boating and fishing. Destin is 'the Luckiest Little Fishing Village' so we knew immediately that we would put down permanent roots here. We want to share our home and treasured beaches with our family from Illinois, friends and visiting guests. We hope you can visit and fall in love with our beautiful paradise just like we did so many years ago! The location of our condo will take your BREATH AWAY!! Our second floor unit is safe and secure, provides spectacular views, away from potential pedestrian noise from pool and the street. The resort is gated for your security and now offers a fitness center. This stretch of Miramar Beach doesn't have unsightly high rises. It provides for a relaxing vacation. Powdered white sugar sand. It squeaks when you walk on it. Gated resort with two pools, tennis court and a fitness center. Unobstructed view of the Gulf of Mexico from living/dining room, kitchen and balcony patio. Washer/Dryer are inside the unit for our guests. We also include laundry detergent. Brand new fitness room available! Just steps from your own parking spot and condo! We have a variety of books in the library within the fitness room. Our balcony has an open view of the Gulf of Mexico and a new table and chairs. Beautiful unobstructed view of Gulf....beautiful sunsets! We have a lighted tennis court. Golf courses just 5 minutes away. Easy access to elevator and doors and hallways are wide enough to accomodate most wheelchairs. Resort was built in 2002 and is located on 8.6 acres with a tropical landscaping, two large pools and lighted tennis courts. The resort has it's own beach and BEACH SERVICE is included. Amalfi Coast is near grocery stores, retail stores and many fine restaurants. We had a great stay at this condo. The condo was spotless and very clean. The view of the gulf is great and we were very close to the beach. The fire pit, pool, and pond were an added amenity. We loved that we could take walks every morning, and then sit on the balcony to eat breakfast. I would have no complaints about this condo. Also, having 2 bathrooms was an extra bonus. My husband had his, and I had my own! This is a great place to stay! And....the beach service was great. I would recommend this condo to anyone. This was our first time using VRBO, couldn't have been easier. Mark and Sally have thought of everything. This condo not only has spectacular views but was equipped with everything you will need for a wonderful, hassle free vacation! Second year - another great stay! Second year stay for Spring break! Great view, great location and great condo!! Ellen, glad your family enjoyed our powder sugar beaches and emerald green waters! Hope to see you again next year! A family friendly condo with a gorgeous view of the ocean. We especially loved the green space within the complex where the kids could feed the fish and watch the birds and turtles. The heated pool and outdoor fireplace provided hours of entertainment. The beautiful white sand beach was right across the road and the host provided two beach chairs with an umbrella that were set up each morning. The unit also had a wide variety of DVD's to watch, complimentary coffee and lots of kitchen spices. We have been traveling to Florida for over 30 years and this was one of our best experiences. If you get the chance be sure to visit Topsail Hill Preserve state park where you can bike, hike and enjoy the sand dunes and prestine beach. Thank you for sharing your little bit of paradise with us. Rita thanks for the review and especially the sweet note your daughter left! It made both Mark and I smile! Kids always love to feed the fish and turtles in the pond....We bought the condo because of all of the green space and the great job the maintenance crew keeps it beautiful. Hope to see you again in the future! My husband and I had a wonderful week in the condo. It is so spacious, very clean and well equipped. We felt at home immediately. The beach is beautiful. Amalfi Coast seems very well taken care of and the people we met were very helpful and nice. The pools and pond are gorgeous. We appreciated the prompt emails from Sally and Mark. We had all the information we needed well ahead of our trip. We would recommend this condo to anyone. Hope to be back some day! Lorraine, we are so happy we could share you a little slice of our paradise with you and your husband. We hope you were able to relax and enjoy you VACA! You were outstanding guests and hope to see you again! Location was perfect. Grounds were immaculate. Great view of the Gulf from the unit. Well supplied kitchen and unit was very clean. Everything needed for your stay was provided. Host was very helpful. Would highly recommend! South Walton 30A, Silver Sands Designer Outlet Mall (Largest in Southeast), Grand Blvd, Destin Commons Shopping Center with 12 Movie Theaters, Championship Golf Courses, Water Sports and Boat Rental, Deep Sea Fishing, Dolphins, Nature Preserves, State Parks.